Taste test: You get a cheese taste at first, but after about three-quarters of a bite, the jalapeño taste kicks in. It's not a make-you-cry jalapeño taste. In fact, it's not really hot at all, but you can definitely taste the Jalapeño flavor. 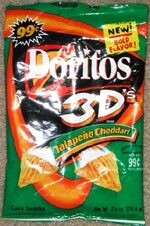 Another opinion: The 3D Doritos have a unique crunch. It's kind of cool. Not extremely hot until after a few seconds. It's good that you taste the cheese first, and then the hotness surprises you. They're pretty good, but I prefer the Nacho Cheesier or Cooler Ranch version of the 3Ds. Smell test: They smell like cheddar.